Since I’ve been in Washington from more than 25 years, it takes something really remarkable to shock me. But when I read today that federal bureaucrats are supposedly underpaid, notwithstanding all the evidence to the contrary, I thought somebody had sent me an article from the Onion. But then I saw that the assertion of underpaid bureaucrats was put together by the stooges at the Federal Salary Council, a body controlled by government employee unions. Here are some excerpts from a Federal News Radio report about their preposterous claim. The gap in pay between federal employees and private-sector workers has jumped 8 percentage points since last year, according to new data presented at a Federal Salary Council meeting Friday. On average, federal employees earn 34 percent less than their private-sector counterparts, according to the council’s analysis. The pay gap, which is calculated using data from the Bureau of Labor Statistics based on pay in 34 locality pay areas, was 26 percent last year. The council, which is made up of labor representatives and pay experts, makes recommendations on federal pay to the President’s Pay Agent. But the article was fair in that it cited some contrary data. A Congressional Budget Office study released in January found, overall, federal employees actually earn about 2 percent more in wages compared to private-sector workers, with wider differences based on education level. But a June 2011 report from the American Enterprise Institute, a conservative think tank, indicated government pay outstripped private-sector pay by 14 percent. Though the author of the article should have cited the work of my colleague Chris Edwards, who has revealed that federal bureaucrats get twice the level of compensation as people in the economy’s productive sector when you include the value of fringe benefits. Here’s my video on the topic, which is filled with factoids. But if you want the single piece of evidence that completely debunks the silly assertion that bureaucrats are underpaid, just go to Table 4 of this Department of Labor release. You’ll find the voluntary quit rate for different parts of the workforce. As you can see from the chart, people in the private sector are more than three times more likely to quit their jobs. Now ask yourself a simple question: Are people more likely to quit jobs when they’re underpaid or overpaid? But that shouldn’t be the end of the discussion. 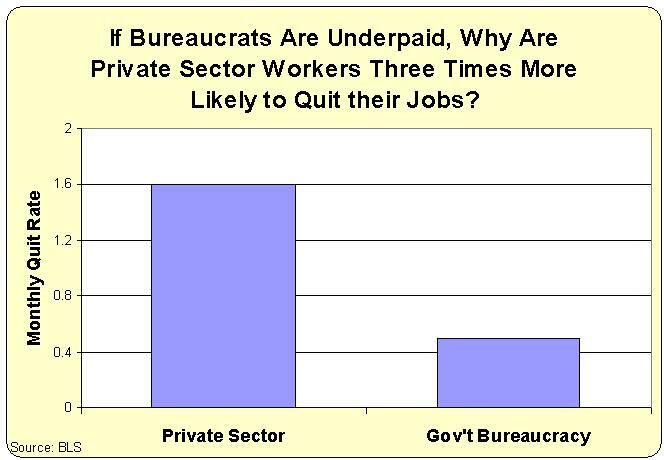 The more important question is whether most federal bureaucrats should even have jobs. I’m mostly concerned about the fact that we have useless bureaucracies such as the Department of Agriculture and the Department of Housing and Urban Development. The fact that the bureaucrats are overpaid at these agencies is merely adding insult to injury. It’s the size of government that we should worry about, period. Funny. I just had this debate on Facebook a few days ago with a former federal employee who indicated who poorly federal employees are treated. I asked why so few quit. He denied the premise. Given how limited his understanding was, I kinda wished he was still a federal employee. We need them as dumb as possible.